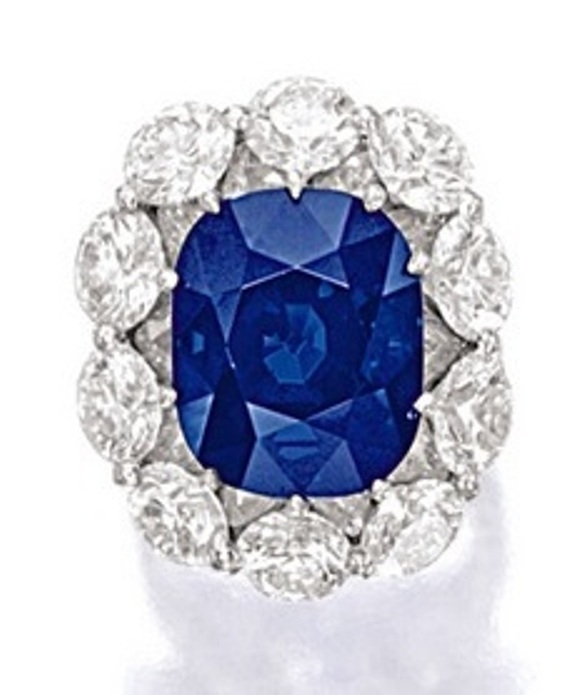 The Sotheby’s Hong Kong Magnificent Jewels and Jadeite Spring Sale 2014 was held on Monday, April 7, 2014 at Hall No. 5, of the Hong Kong Convention and Exhibition Centre. A total of 322 lots assigned lot numbers 1601 to 1921, with an estimated value in excesss of HK$775 million (US$99 million) was on offer at the auction. However, the demand for the some of the lots were so strong that the total realized by the sale exceeded all expectations, registering HK$ 831.6 million (US$106.6 million). The lots consisted of a varied selection of jewelry set with colored and colorless diamonds, natural colored gemstones and jadeite, including signed jewelry by famous designers and jewelry houses. Two of the “Tremendous Trio” – three highly important necklaces representing the ultimate in diamonds, gemstones and jadeite, represented by Lot Nos. 1921, 1914 and 1847 respectively – the prime lots at the auction, did extremely well at the auction, breaking auction records. 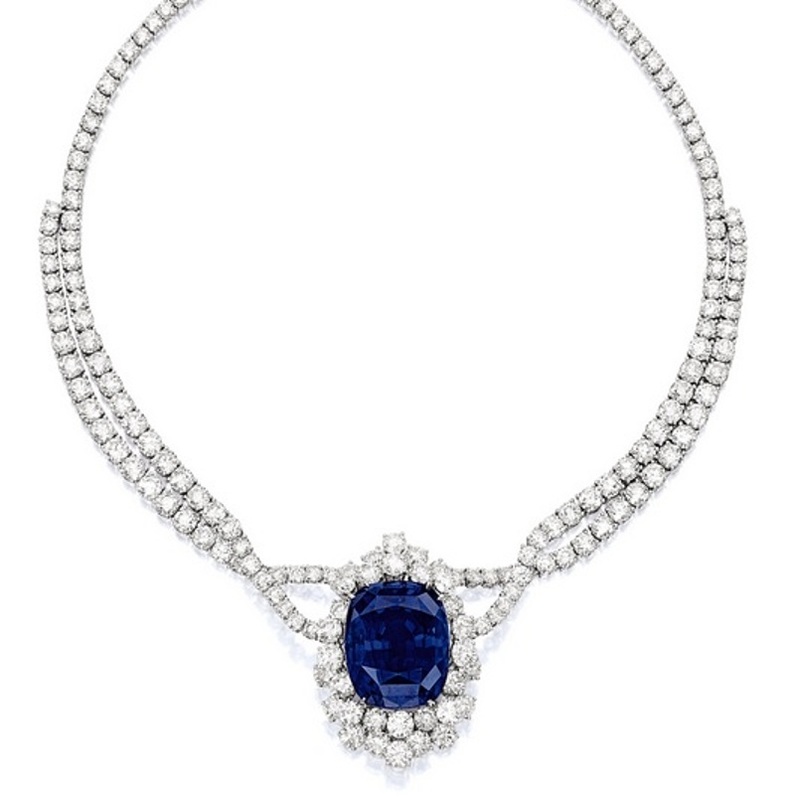 However, Lot 1921, a spectacular diamond necklace designed by Nirav Modi, whose creative designs have registered top prices at Sotheby’s auctions previously, failed to sell this time, probably because the lot failed to realize its reserve. Lot 1847 – A Highly Important Jadeite Bead, Ruby and Diamond Necklace by Cartier, Circa 1933 – also known as the Hutton-Mdivani Jadeite Necklace, reflecting its important provenance, once owned by Barbara Hutton, the Woolworth heiress, but later given by her to her childhood friend and her husband Alexis Mdivani’s first wife Louise Astor van Allen. Alexis Mdivani died in an automobile accident. Louise Astor van Allen gave the necklace to Princess Nina Mdivani in whose collection the necklace remained until her death in 1987. The Hutton-Mdivani Jadeite Necklace had appeared at public auctions at least on two occasions before, once in 1988 when it appeared at an auction in Geneva as Part of Princess Nina Mdivani’s Collection, setting a sensational world record price of US$2 million, the highest ever paid for a piece of jadeite jewelry, and again six years later in 1994 at an auction in Hong Kong, when it was sold for double its previous hammer price, achieving an astonishing US$4.2 million, setting a new record yet again for jadeite jewelry worldwide. Since then, this impressive jadeite bead necklace has become one of the most legendary and important piece of jadeite jewellery known to the world. It is an irony that “Cartier Collection” had to to dish out such an enormous sum of money for one of its own creations, designed over eight decades ago, but this is a clear reflection of an example that great design is the core of what makes classic jewelry not only to hold its value but enhance it over the long term. The “Cartier Collection” is committed to assemble and present the historic Cartier heritage in jewelry designing since the company’s founding in 1847, to the jewelry-loving public around the world, by organizing traveling exhibitions in prestigious natural history museums; and consists of almost 1,500 exceptional antique pieces of jewelry and watches designed by Cartier, and acquired by the Collection in public sales or from private individuals. It is in keeping with this objective that the Company went all out to acquire the Hutton-Mdivani Jadeite Necklace, the most legendary and important piece of jadeite jewelry known to the world. 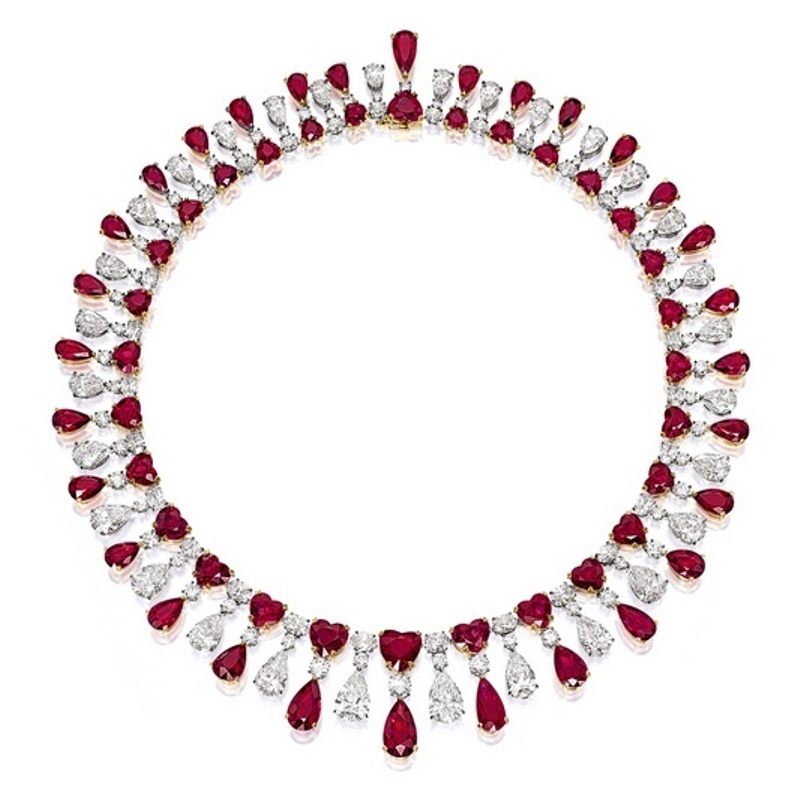 Lot 1914 – A Superb Ruby and Diamond Necklace by James W. Currens – is the other “Tremendous Trio” that created an impression at the auctions and sold within the estimated range for HK$77,400,000 (US$ 9,979,182). The fringe necklace referred to as the “Red Emperor” is a magnificent Burmese (Mogok) ruby and diamond necklace set with 60 heart-shaped and pear-shaped pigeon’s blood rubies weighing 104.51 carats and spaced by brilliant-cut pear-shaped and oval diamonds weighing 59.05 carats and designed by James W. Currens for Rajeev Lunia of Fai Dee Gems Co. Ltd. of Hong Kong. 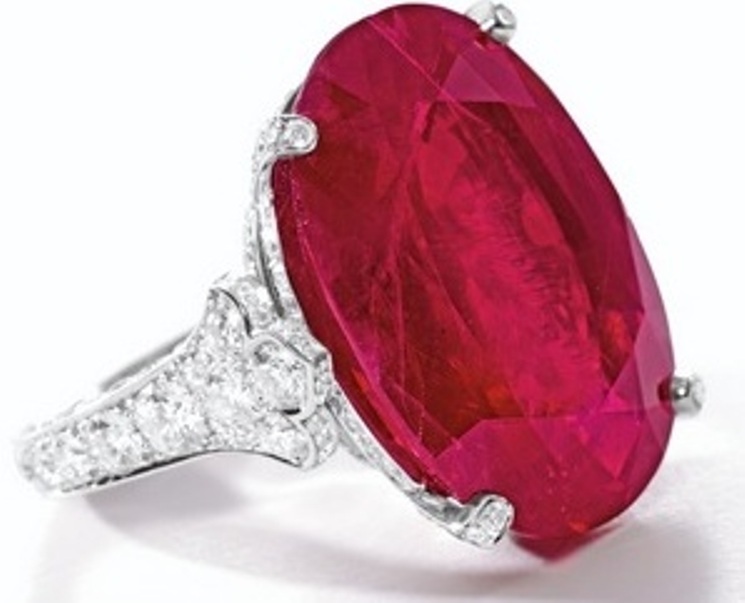 Another lot that set a world auction record for a ruby was lot 1762 – An Impressive and Important Ruby and Diamond Ring, designed by Cartier, that sold within the estimated range for HK$ 57,240,000 (US$ 7.34 million). The oval-cut, 29.62-carat, pigeon’s blood Mogok ruby is an extremely rare gem given the fact that, while sapphires, emeralds and diamonds weighing hundreds of carats do exist, high-quality Burmese rubies greater than 20 carats are an exceedingly rare occurrence. Lot 1906 – A Highly Important Jadeite Bangle – is another lot that did significantly well at the auctions registering a price within the estimated range of HK$ 43,800,000 (US$ 5,647,134). The highly translucent, emerald-green, oval jadeite bangle, rounded on the outside and flattened on the inside, is a rare and fine example of a “Guifei bangle” (noble consort bangle), first created in China by Yang Yuhuan aka Yang Guifei, one of the four beauties of ancient China, the most favorite concubine of Emperor Xuanzong from the Tang Dynasty, who ruled China between 712-756 A.D. 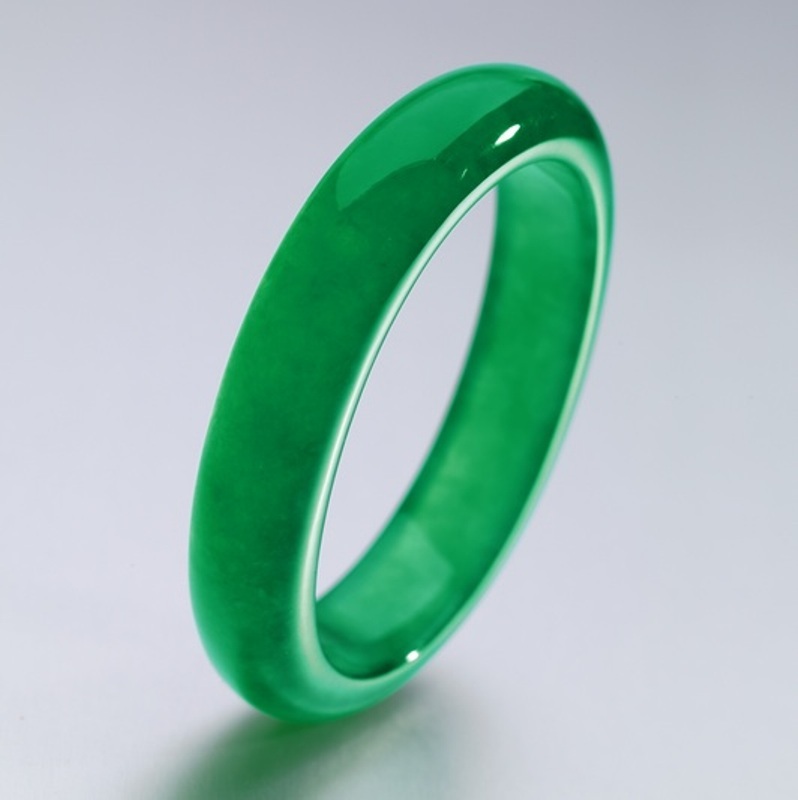 Such jadeite bangles were created from large blocks of crack-free and blemish-free jadeite, by hollowing out the center, involving high wastage. The occurrence of highly-translucent, crack-free and blemish-free emerald-green jadeite is extremely rare and hence the rarity of this oval Guifei bangle. Lot 1766 – An Impressive and Rare Sapphire and Diamond Necklace – said to be incorporated with the first top-quality sapphire of over 100 carats to appear at an auction in Asia, also did extremely well at the auctions, selling above the upper estimate of HK$30,000,000 for HK$ 32,600,000 (US$ 4,203,118). 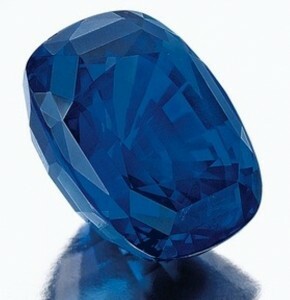 The cushion-shaped sapphire weighing 102.61 carats, is a Sri Lankan sapphire highly prized for its extraordinary clarity and even color despite its relatively large size. The sapphire has a pure saturated even blue color combined with an alluring luster and lively brilliance, a result of its high-clarity causing maximum light return. The sapphire is the centerpiece of a double-strand necklace, set with 60 carats of brilliant-cut diamonds, mounted in 18k white gold. Lot 1760 – An Exceptional Sapphire and Diamond Ring – with a pre-sale estimate of HK$ 12,000,000 – HK$ 17,000,000 (US$ 1,547,280 – US$ 2,191,980) and set with a 20.04-carat, cushion-cut Kashmir sapphire also performed well at the auction, selling above the upper estimate for HK$ 20,280,000 (US$ 2,614,701). 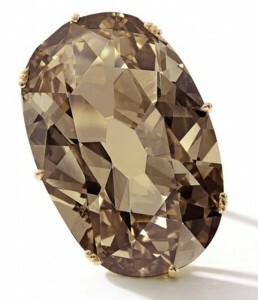 Lot 1741 – A Unique Fancy Brown-Yellow Diamond Ring- set with an oval-cut fancy brownish-yellow diamond weighing 49.31 carats mounted in 18k pink gold, sold for HK$13,480,000 (US$ 1,737,977) within the estimated range. An unmounted round brilliant-cut diamond weighing 30.57 carats described as a highly important unmounted diamond and assigned lot 1910 also did extremely well at the auctions fetching HK$ 51,080,000 (US$ 6,585,745) within the estimated range.